Thai chicken nachos made with waffle fries? Yes, please! Baked waffle fries are topped with chicken that’s been cooked and tossed in a Thai peanut sauce, chopped bell pepper and Cabot Vermont Sharp Shredded Cheddar Cheese, then baked until the cheese is melted. This unique spin on chicken nachos is amazing and addictive - once you try them you’ll be hooked - and so will anyone else who has the pleasure of being there to enjoy them with you! Share this chicken nachos recipe with friends and family on Facebook, Pinterest, Instagram, and Twitter! Bake waffle fries according to the directions on the package. Toss cooked, cubed chicken with the Thai peanut sauce. Top waffle fries with the chicken, chopped red bell pepper and Cabot Vermont Sharp Shredded Cheddar Cheese. Bake an additional 5-8 minutes until the cheese is melted. 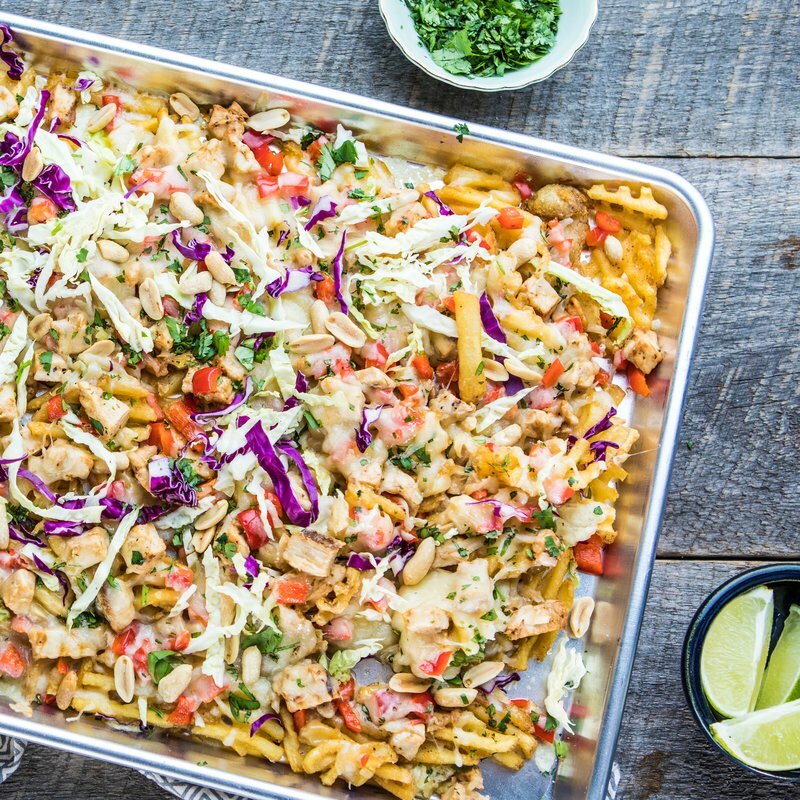 Garnish chicken nachos with shredded red and green cabbage, chopped peanuts, cilantro and a squeeze of lime. If you love these, which we know you will, be sure to try out our tasty variations for Taco Waffle Fry Nachos, Black Bean and Sweet Potato Waffle Fry Nachos and Pizza Bacon Waffle Fry Nachos. You’ll find instructions for these variations below the recipe directions. For another crowd-pleasing nachos recipe, try our Smoked Turkey Nachos. 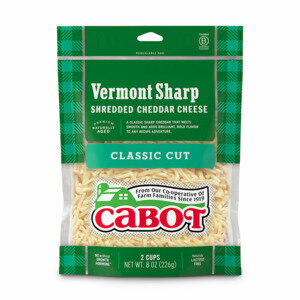 Cabot is a co-operative of over 800 farm families who continuously strive to produce the best dairy products around. If you love these Thai nachos as much as we do, we’d really appreciate it if you could rate and review the recipe when you have the chance! TOSS chicken with the Thai Peanut Sauce. TOP waffle fries with the chicken, red bell pepper, cheese, and bake an additional 5-8 minutes until the cheese is melted. GARNISH with the cabbage, peanuts, cilantro and a squeeze of lime. Bake a 22 ounce package Waffle Fries according to package. 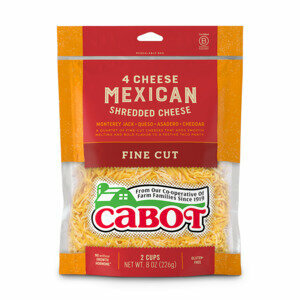 Top fries with 2 cups of any taco meat, and 8 ounces Cabot of 4 Cheese Mexican Shredded Cheese. Garnish with Cabot Sour Cream, sliced scallions and guacamole. Bake a 20 ounce package of Sweet Potato Waffle Fries according to package. 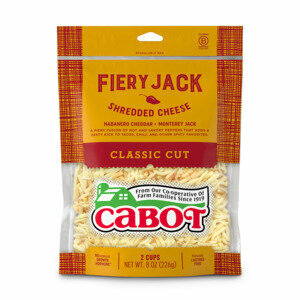 Top with 15 ounce can of black beans, drained and rinsed and 8 ounces of Cabot Fiery Jack Shredded Cheese. Garnish with cilantro, chopped tomatoes, and a squeeze of lime. Bake a 22 ounce package Waffle Fries according to package. 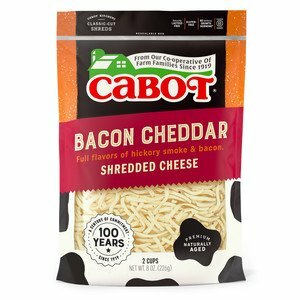 Top fries with ½ cup Pizza Sauce, 1 green bell pepper, seeded and diced, 2¼ ounce can sliced black olives, drained, and 8 ounces Cabot Bacon Cheddar Shredded Cheese. Bake an additional 5-8 minutes until the cheese is melted and garnish with fresh basil.